Elegant, versatile and dependable – wood finish wardrobes are all these and more. Featuring a textured appearance, raw finish and versatile hues, these wardrobes can blend in with any kind of look and decor. The Mackinley Straight Wardrobe is a perfect example of how seamlessly the wardrobe can be incorporated into your space. It has a dark rosewood finish and works with any color palette. The light finish of this Antia Straight Wardrobe and floor to ceiling height give it maximum space for storage. The design works well with a lighter decor palette. Unlike other wardrobes, the drawers as seen in this Fabien Straight Wardrobe work well to store smaller accessories and clothing. 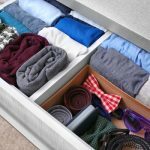 This makes storage easy and very accessible. Unlike polished or smooth finish, wood finish wardrobes as this Hawthorn Straight Wardrobe lend a textured appearance that gives a rustic look as well as acts like a focal point. They help bring out the design and look of the rest of the bedroom. The warmth, glow and solidness to this space is lent by the Mathis Straight Wardrobe. Designed in a dark hued mahogany finish, it balances the space and separates out the bedroom into two distinct areas. 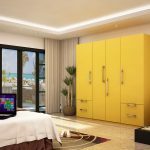 Choose the best and most versatile wardrobe design for your bedroom, from our extensive design catalog at HomeLane – Wardrobes.